~Hangs over your shoulder so it's always within reach for grabbing hot items or being used as a prep towel. ~MACHINE WASHABLE. Dryer safe or air dry. Hang over oven door handle when washed so it's easily within your reach. ~ HEAT RESISTANT / NON-SLIP GRIPS allow you to hold hot cooking, baking, & grilling utensils, tools, dishes, pots, & pans.It is convenient. ~The Oven Gloves with hook design, you can hang on the wall when they are free to use. ~ With a high-quality Flame retardant cotton outer shell and a soft quilted lining made of 100% polyester cotton, offering you superior protection and comfort. 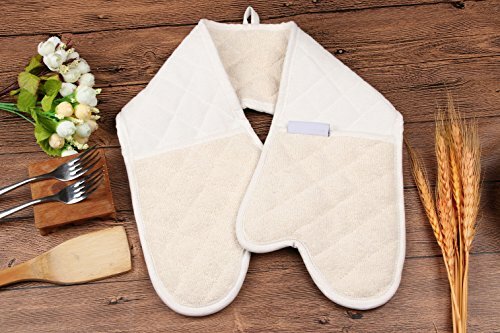 These kitchen linen sets are heat resistant, protect your hands while handling hot pots, pans, dishes, casserole dishes and more. MACHINE WASHABLE. Dryer safe or air dry. Hang over oven door handle when washed so it's easily within your reach.